I'm a little late in writing this post. We've been busy the past few weekends, so forgive me but better late than never, right? These croissants were so delicious, flaky, and buttery. They require quite a bit of time to put together, so be sure to begin making this a few days before you plan on eating them. We made a few plain for breakfast, and added chocolate to the rest for dessert! 4. Place the flour in a large bowl. Add the oil, yeast mixture, and milk mixture to the flour. Mix all the ingredients together using the rubber spatula, just until all the flour is incorporated. 5. Turn the dough out onto a floured surface, and let it rest a minute while you wash out the bowl. Knead the dough eight to ten times only. 6. Place the dough back in the bowl, and place the bowl in the plastic bag. 7. Leave the bowl at room temperature for three hours, or until it has tripled in size. 8. After the dough has tripled in size, remove it gently from the bowl, pulling it away from the sides of the bowl with your fingertips. Place the dough on a lightly floured board or countertop, and use your hands to press it out into a rectangle about 8 by 12 inches. 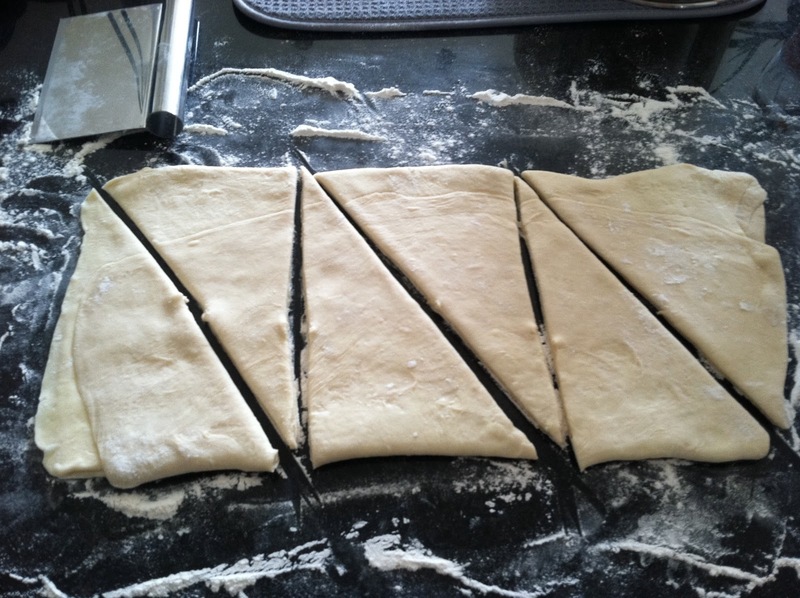 Fold the dough rectangle in three, like a letter (fold the top third down, and then the bottom third up). Place the dough letter back in the bowl, and the bowl back in the plastic bag. Leave the dough to rise for another 1.5 hours, or until it has doubled in size. This second rise can be done overnight in the fridge. 9. Place the double-risen dough onto a plate and cover tightly with plastic wrap. Place the plate in the fridge while you prepare the butter. Once the dough has doubled, it’s time to incorporate the butter. Place the block of chilled butter on a chopping board. Using the rolling pin, beat the butter down a little, till it is quite flat. Use the heel of your hand to continue to spread the butter until it is smooth. You want the butter to stay cool, but spread easily. 10. Remove the dough from the fridge and place it on a lightly floured board or counter. Let it rest for a minute or two. Spread the dough using your hands into a rectangle about 14 by 8 inches (35 cm by 20 cm). 11. 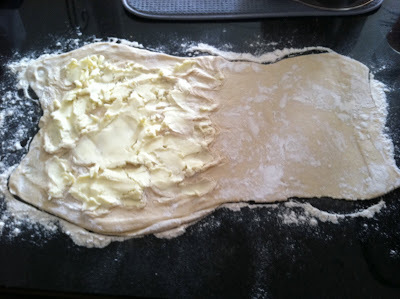 Remove the butter from the board, and place it on the top half of the dough rectangle. Spread the butter all across the top two-thirds of the dough rectangle, but keep it ¼ inch across from all the edges. Fold the top third of the dough down, and the bottom third of the dough up. Turn the dough package 90 degrees, so that the top flap is to your right (like a book). Roll out the dough package (gently, so you don’t push the butter out of the dough) until it is again about 14 by 8 inches. Again, fold the top third down and the bottom third up. Wrap the dough package in plastic wrap, and place it in the fridge for 2 hours. 13. Ready to make the croissants? First, lightly butter your baking sheet. Take the dough out of the fridge and let it rest for ten minutes on the lightly floured board or counter. Roll the dough out into a 20 by 5 inch rectangle. Cut the dough into two rectangles (each 10 by 5 inches). Place one of the rectangles in the fridge, to keep the butter cold. Roll the second rectangle out until it is 15 by 5 inches. Cut the rectangle into three squares (each 5 by 5 inches). Place two of the squares in the fridge. 14. The remaining square may have shrunk up a little bit in the meantime. Roll it out again until it is nearly square. Cut the square diagonally into two triangles. Stretch the triangle out a little, so it is not a right-angle triangle, but more of an isosceles. Starting at the wide end, roll the triangle up towards the point, and curve into a crescent shape. Note: If you would like to make a chocolate croissant, roll broken pieces of chocolate as you roll the dough. 16. Preheat the oven to very hot 475°F. 17. Mix the egg with a teaspoon of water. 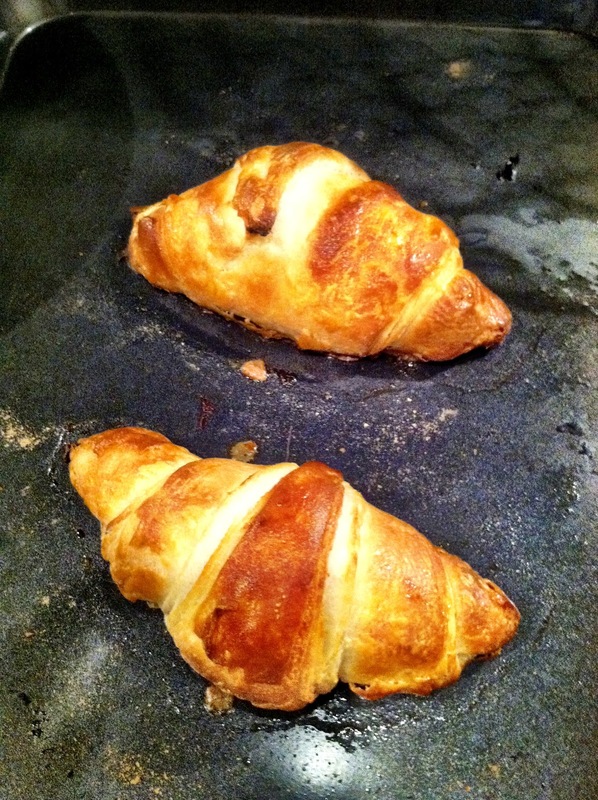 Spread the egg wash across the tops of the croissants. 18. 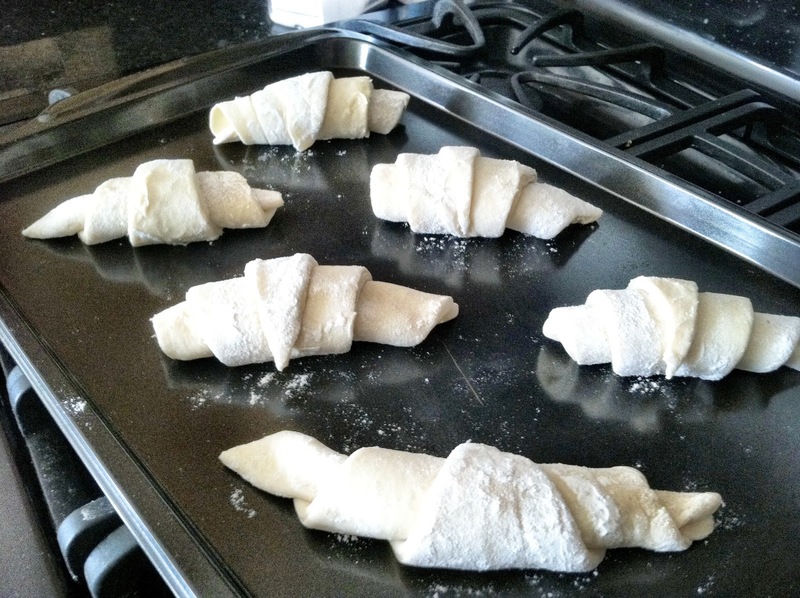 Put the croissants in the oven for 12 to 15 minutes, until the tops are browned nicely. Take the croissants out of the oven, and place them on a rack to cool for 10 minutes before serving. Serve with jam or butter!